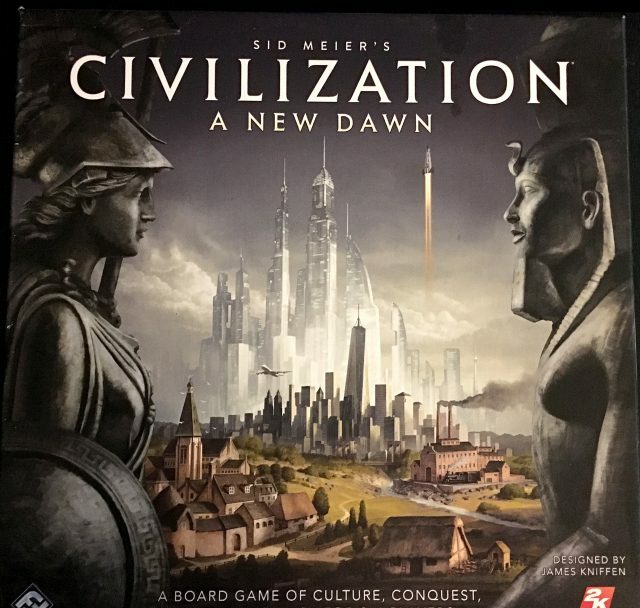 I spent the last two columns retracing the steps of the Civilization 4X genre–games that to some extent or other try to recreate the epic sweep of the Sid Meier’s Civilization franchise, currently on its sixth iteration. I’ve been playing them since Civ1 way back in 1991 (I bought my first VGA monitor just so I could play it) and I’m basically a sucker for any game (video or tabletop) which pretends to simulate history. 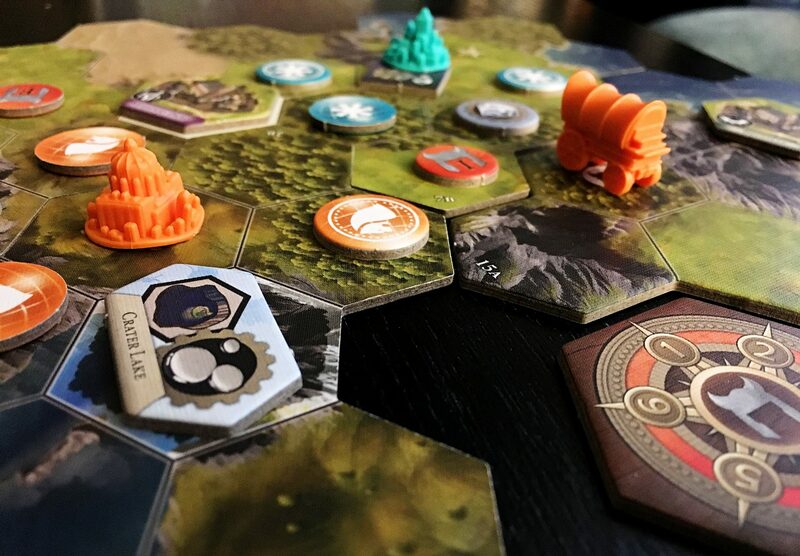 So how does Civilization: A New Dawn (C:aND henceforth) stack up? Let’s take a look under the apex of the pyramid, kick the chariot wheels, and have a look-see. Fantasy Flight decided against asking Kevin Wilson to revisit his 2010 design. Interesting decision, because Civ2010 was a very successful release, spawning two expansions and getting a lot of love from fans. Maybe Wilson was unavailable. Maybe they felt Civ2010 had turned into an unwieldly beast and they wanted a fresh take. As it is they turned to fledgling in-house designer James Kniffen. Kniffen first began with FF in 2012, and for his first couple of years appears to have been put to work on expansions and clamshell packs for games like Rune Age, Star Wars X-Wing, and Battlestar Galactica. Then in 2015 he was allowed to collaborate with established designers on core games: Christian T. Pederson and Star Wars Armada, Corey Konieczka and Forbidden Stars. Finally, in 2016 they took the training wheels off and let him ride solo on the latest boardgame set in the Android universe, New Angeles. And then he was handed the formidable task of reinventing Sid Meier’s Civilization yet again. He kept almost nothing of Wilson’s design. It was really the only option available. Why reinvent the wheel? And furthermore, a design that was “new” in name only would never entice owners of Civ2010 to plunk down more money. Of course it risked being compared unfavorably with Wilson’s design. But in my opinion it was the right move. This divergence starts with the victory conditions. Kniffen clearly decided that replayability and variety were a priority and wanted to prevent “perfect plans” and dominant strategies. Therefore instead of having static victory conditions, he provides five Victory Cards, of which three are used in any game. Some involve the number or quality of your cities, others the number and kind of Wonders you build, still others are combat- or tech-related. Each card has two possible achievements, and the winner is the first to attain one achievement on each card. As with many things in CaND, it’s a straightforward yet brilliant design choice which in hindsight looks obvious. Next let’s look at the board. It’s modular, yes–but using a hex-grid instead of Civ2010’s squares. This brings the tabletop version into line with the videogame, which moved over to hexes with Civ5, and (as all consim players know) has geometric advantages over a square grid in terms of movement. The board also begins totally face-up, so players begin with total knowledge of the geography of their world. So the element of exploration is gone, but for reasons I’ll explain shortly, it made more sense gamewise. The size of the map scales according to player count, but in any event is pretty small, but you have a few rounds to expand locally before butting up against other empires. One new concept which helps balance out starting positions are the rules around so-called “mature cities”. In Civ2010, cities on the coast or border of the map were inherently worse because there weren’t as many spaces to put buildings up (and the only building allowable on water squares were ports). In CaND, mature cities are completely surrounded by controlled hexes and they produce goods every so often as well as being a potential victory condition. The clever balancing comes in because ocean hexes and the board edge reduce the number of hexes needed to be controlled for a city to become mature. All of a sudden it makes more sense to build on the coast or the edge of the board. One new element in CaND are City-States, which will be familiar to Civ5 and Civ6 players, and I for one welcome them for adding some nice chrome to the game. 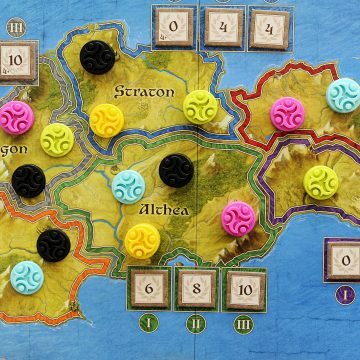 As in the computer versions, each one specializes in a certain area (combat; culture; science; economy) and can be traded with (providing trade goods as well as Diplomacy cards with special powers) or conquered (which integrates them into your empire). Conquered City-States can be liberated or assimilated. There’s a good variety of civs to choose from, with graphics pulled from Civ6. Each civ starts with a special power, somewhat thematic and similar to those in the videogame (the Egyptians get a boost building wonders, the Romans have an easier time making trade routes, and so on). They also each have different Focus priorities–which are the heart of the game, and therefore make opening turns refreshingly asymmetric. The Focus system is the central and defining mechanism of CaND. 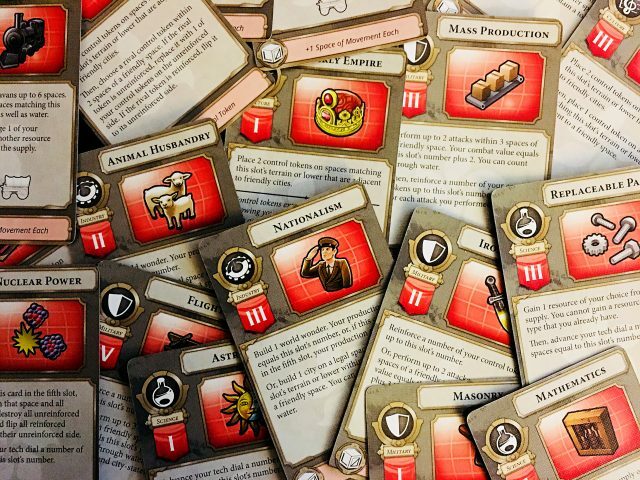 Each player has a choice of one of five actions on their turn, each choice represented by a tech card from a different category: science, culture, combat, production, and trade. The order of the cards determines how powerful the action is when you take it, a value from 1 (weakest) to 5 (strongest). After you take your action, you reset it by sliding it down to 1 and moving the rest of the cards up. So the longer you let a particular action “marinate”, the better it will be. Certain techs and wonders let you manipulate this system a little but other than that it’s a simple and elegant mechanism that unifies the whole game instead of needing separate systems for each action. This drastically cuts down on complexity and teaching time without sacrificing tactical or strategic depth. And as I said, since each civ begins with a different Focus card setup, they are nudged (at least at first) along different and thematic lines. Your scientific development is represented by a tech dial–the one main idea carried over from Civ2010, but here too Kniffen streamlines things. Passing certain thresholds on the dial lets you upgrade one of your Focus cards: the first two let you upgrade to level 2, the next two to level 3, and the final two to level 4. But you don’t have to have the intermediate levels to upgrade, so a late-game upgrade from level 1 to level 4 is perfectly legal and definitely a game-changer which your opponents need to prepare for. Each higher level Focus card gooses up the basic action more. Interestingly, higher Focus levels do not always include each ability from lower-level versions–which means depending on your long-term strategy you may not want or need to level up a particular action all the way in order to win–all the better, in my book. Culture and combat are taken care of quite abstractly, through placement of control markers on the map. So if you love the cut and thrust of Civ2010’s combat system, you’ll miss it here. On the other hand, CaND’s system is quick, streamlined, and doesn’t bring the game to a halt for the other players, so I call it a win. Another neat frill Kniffen added to CaND that was missing in previous versions is roving barbarians that respawn every few turns. As in the videogame they can be royal pains in the early game, but once you’ve upped your combat and culture enough you can eliminate and/or assimilate them. They provide just enough unpredictability to add a hint of danger, but not enough to spoil the game. The four types of resources in the game are used mainly to help build Wonders. The map begins seeded with one-use resource tokens which can be harvested and Natural Wonders which provide a reusable resource if you can integrate one into your empire. You can get more from certain techs and certain City-States. 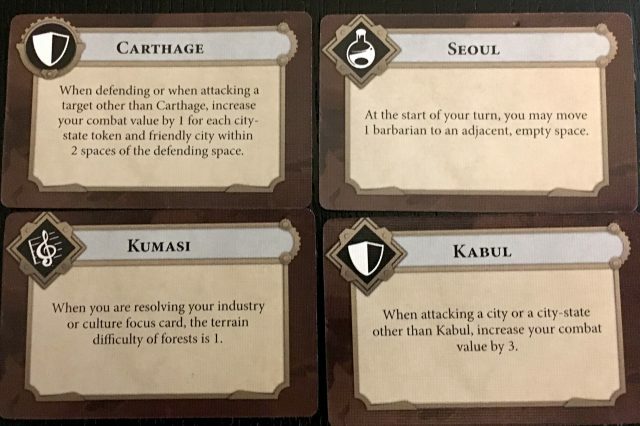 Then there are generic trade tokens which live on your Focus cards which you can use up to buff the action; you get them from offing barbarians, sending Caravans to rival cities, and certain techs. Again, everything fits together smoothly without special rules, exceptions, and fiddly edge cases. Second, the control tokens are printed back-to-front as far as I’m concerned. You see, control tokens have two steps, potentially–after placing them with a culture action, you can “reinforce” them by flipping them over with a combat action, which gives them an extra step for combat, and all surrounding friendly hexes a combat boost. My natural inclination is to place them rounded-side up–but that’s the reinforced side. They just look wrong. I’m wracking my brain trying to think of other gripes, but I can’t–other than those who want a more meaty combat system will be disappointed. I hope an expansion with more civs and terrain tiles comes out soon. I don’t need more systems bolted on (except maybe something around religion, that would be cool). The game flows really nicely and doesn’t outstay its welcome, and because each player only takes one action per turn there’s hardly any downtime. You can tell by now that I think CaND is a fine design. The question is: how does it stack up against its historical competitors? Well, for me, it’s up there with Historia and The Golden Ages (the latter especially with its Cults & Culture expansion). Of the three it’s probably the easiest to learn and play right off the bat, and it’s got the smallest footprint in terms of how much table you need. But each of these games scratches a slightly different itch: Historia focuses on tech and cardplay at the expense of geography and combat; The Golden Ages is about managing your actions and resources–but the expansion adds in culture and religion, which add a lot of depth. As far as rules and graphics go they’re all top-notch. My advice is to try all three and see which one you like best.